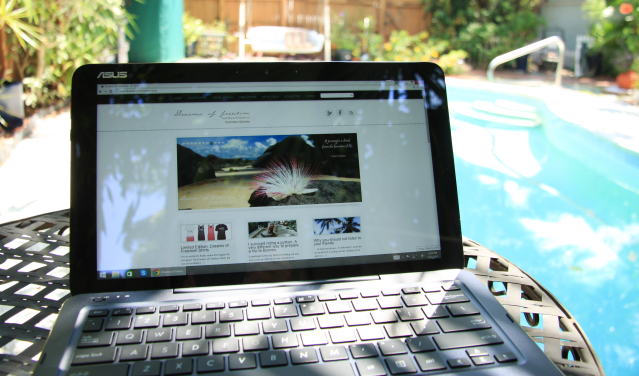 Last week I got sent the ASUS T300 Chi to try it out during my daily work routine. As a travel writer you can never have enough gadgets. Well… I guess you can but it’s definitely good to have a backup! First the obvious, the size! 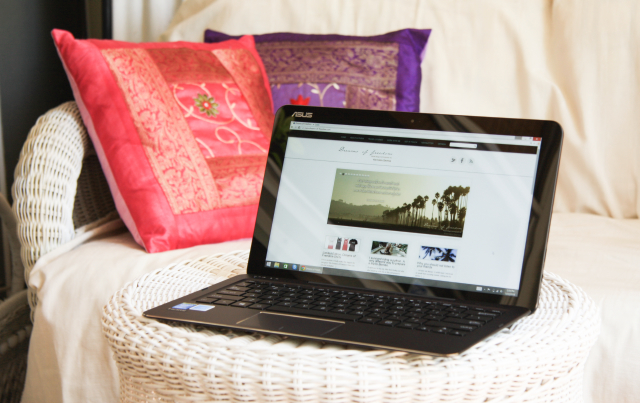 Currently the ASUS T300 Chi is one of the slimmest devices available (even thinner than the MacBook Air!). It even fits in my purse. When you are traveling you want to save as much space and weight as you can. When you are running to catch your flight or even just walking around on the airport after being awake for 20 hours, you don’t want to be weight down by a huge laptop. Of course you can always pull it around behind you in a trolley but once you get on the plane and want to work a little or simply watch a movie, it is nice not to have your seat neighbor share their fold up table with you because you brought your entire office! The battery lasts for 10 hours so I can easily work and play on the go. If you are a creative mind as well, you may understand my dilemma. Sometimes I’m out and about and an idea strikes me. If I can find a piece of paper I jot it down but mostly those little notes get lost in the depths of my purse. Sometimes I type it in my phone and the same thing happes or I don’t remember what it meant, once I stumble across it again. Now I can just pull out the Chi and create whole blog posts (if I have the time) or at least get down the most important points and at least have a rough draft of something I would have forgotten otherwise. The Chi slogan is “It’s easy to get attached” and I have to admit, it’s true! This Transformer Book is a handy little helper on the go. I think it will really change the way I work. Lost in Translation – No Umlauts! One little thing I was missing, were the umlauts on the keyboard. You may ask: What is she talking about? As you may know, I am German and moved to the US in 2012. I got used to many things in this country and adapted my lifestyle to a lot here. One thing I will never give up are “my” umlauts! You know, those funny vowels with the dots on top!? – ä – ö – ü – I need them, because I also write in German and I don’t want to go through the complicated key combinations in order to create them or exchange them through ae, oe and ue. Of course I cannot really whine about this. The most important thing as a traveler and world citizen, is being able to adapt to any situation. You can never have it all but you can try and use some great resources to help you with that. No problem! The Chi has my back! The screen is connected to the keyboard with a strong magnetic hinge. At first I didn’t even know how it was connected and was afraid to break it but when when you lift up one side of the screen, it comes off super easy. However I am not afraid, it could fall off on it’s own. Earlier I sat down the laptop on a metal table and could feel the power of the magnet. So I suggest you don’t keep your credit cards anywhere near the laptop! A few Details – For you techies out there! Dimensions – Pad: 317.8 x 191.6 x 7.6mm – Pad + dock: 317.8 x 191.6 x 16.5mm Pretty impressive! What else am I doing with the Chi? Using it for travels or even when I go somewhere in daily life is almost a given but even at home, it is a fun gadget to have around. Just overdose on Netflix on a lazy day. The screen is crytstal clear and the sound is beautiful. Talk to your family overseas using Skype or browse through your favorite travel memories! Of course you can also download some games from the Windows App Store just like all the other useful apps you may need. If you will excuse me? I have to get back to my Chi and go on with my chess practice now. My AirBnB host’s 9 year old gandson Magnus almost beat me the other day. I don’t want to make the next game too easy for him. What would you use the ASUS T300 Chi for the most? The device looks kinda cool but boes the battery really lasts for 10 hours? Some reviews on amazon.com say it’s just 5-6 hours. Is it possible to work outside (cuz of the glossy display)?